Disabled World War II veterans, like World War I vets, needed automobility to re-enter civilian life and earn a living. However several factors combined to increase the demand for accessible vehicles. During the interwar years, automobiles were becoming more common and beginning to transform the American landscape and lifestyle. By the end of World War II, automobiles had become a staple of American life and drastically altered the nation’s cityscapes and countryside. Access to personal transportation had nearly become a necessity for daily life, especially in areas lacking mass transit systems. General Motors and Ford both modified cars for disabled veterans and soon thereafter civilians. 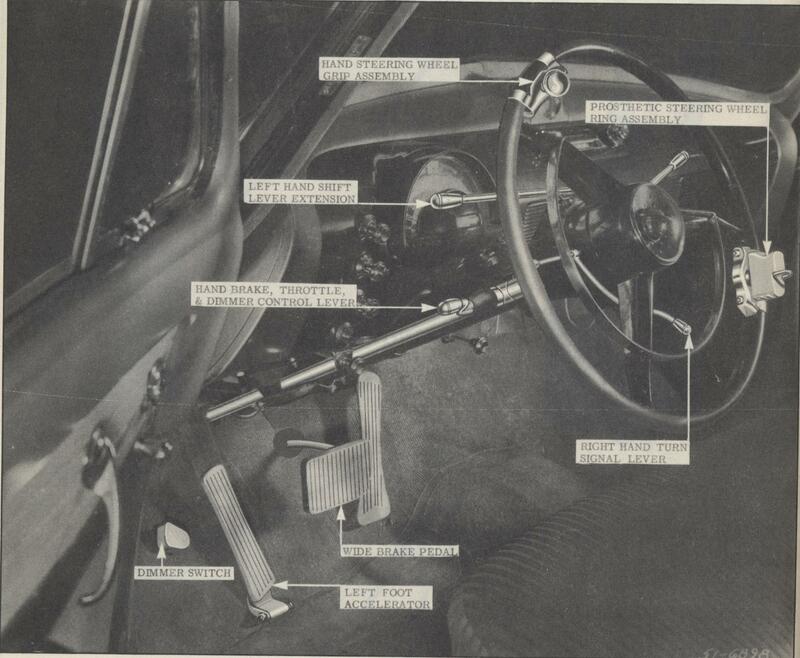 Cars with automatic transmission were modified with various hand controls, steering wheel spinner knobs, extensions, or alternate pedal configurations to accommodate the particular needs of disabled drivers. During and after World War II, Oldsmobile began using the Hydramatic transmission along with other modifications to make their automobiles accessible to disabled veterans. These marvels of adaptive technology were known as "Valiant Equipped." General Motors customized Hydramatic-equipped cars to suit individual drivers. Modified controls accommodated drivers with paralysis, missing limbs, and limited mobility in the arms and hands. Some of the modifications included a left foot gas pedal, spinner knob, power windows, and extensions on secondary controls such as turn signal lever and emergency brakes. Henry Ford made a similar commitment to provide accessible automobiles to wounded warriors, and it can be summed up by this quote: "The least we can do for these men is to be sure they get an even break with those who come back without major disabilities and we do not want any profit incentive to enter into this picture. No man who lost a limb in the armed services of our country during the war is going to have to pay anything extra to drive a Ford automobile." Ford and Mercury provided these modifications to veterans at no extra cost beginning in 1940. 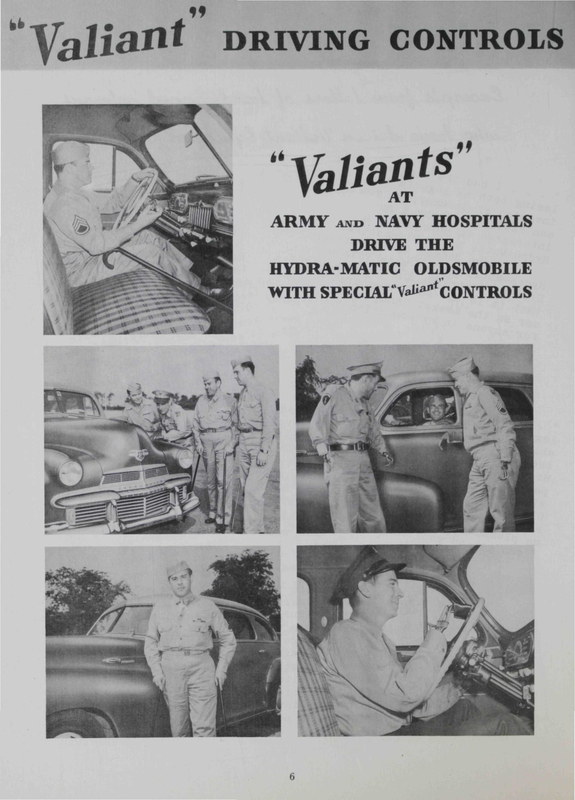 Click here to view a PDF of a 1946 Buick Valiant Catalog. By 1946, however, with the war over, General Motors and the other auto companies began shifting back to their normal production plans. The American public was hungry for new automobiles, but before the new models started appearing in the showrooms, GM provided the first Buicks and Oldsmobiles off the assembly line to seriously wounded soldiers, and particularly to the amputees at Percy Jones Army Hospital. Each car was specially equipped to compensate for the individual disability of each veteran. Then the brand new automobiles were delivered right to Percy Jones, ready for their new owners. The disabled soldiers still had to pay for the vehicles. When I learned that an Oldsmobile dealership needed a salesman to pitch the cars to servicemen and women inside Percy Jones, the entrepreneurial side of me shifted into gear. . .My job was to sell the cars to fellow patients, and I would make a six percent commission on every vehicle sold. Selling cars inside the hospital was easier than it might seem, since many of the patients had some savings. I had a captive audience. Moreover, most Americans hadn't seen a new model since the United States entered the war, so many of us were excited about driving the new cars. I sold six cars, but when the army brass learned of it, they pulled the plug on my venture. Nevertheless, I later qualified for a car myself under a different program, in which the government paid $1,500 toward the purchase of one of the specially equipped vehicles. — Bob Dole, One Soldier’s Story: A Memoir. (New York: Harper Collins, 2005), 219. Many disabled World War II veterans used steering wheels similar to Frank Fithen's with rings to accommodate their residual limbs or split hook prosthetics. However, many veterans like Dole drove one-handed with the use of a spinner knob attached to the steering wheel. Along with the spinner knob, he made use of automatic transmission and power windows to operate his cars. 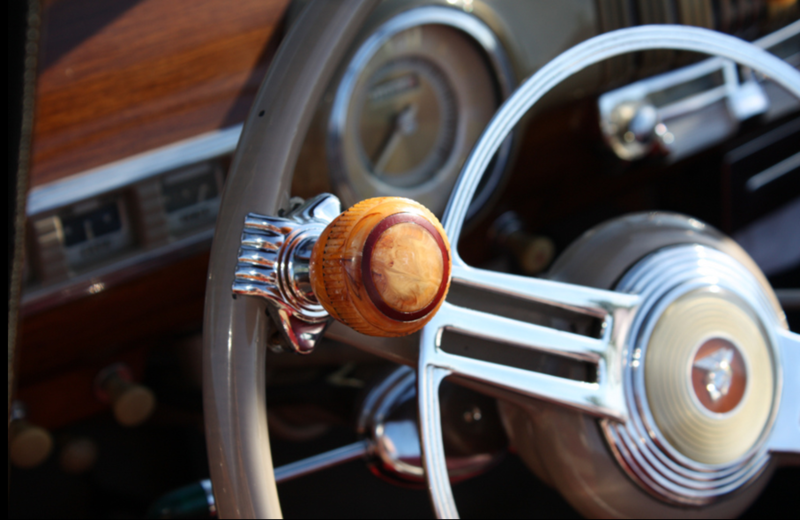 During the 1940s and 1950s, steering wheel spinner knobs were widely popular among automobile enthusiasts and disabled drivers. These freely spinning knobs offered an advantageous grip for any driver and enabled one-handed steering. Colloquially these knobs were referred to as necker knobs by those drivers who kept one hand on the wheel and one arm around a date. Spinner knobs, combined with hand controls and automatic transmission, also enabled amputees and those with varying degrees of paralysis to drive safely. If a person was paralyzed on the right side from a spinal cord injury or a stroke, a spinner knob with a left-foot gas pedal enabled driving with the left arm and leg. Over the decades, the basic concept of the spinner knob has been adapted to accommodate a wider variety of users who cannot properly grip a knob or prefer a different grip. Today's adaptive steering wheel spinners allow interchangeable grips that include a single post, tri-pin, palm grip, or specialized glove. These specialized grips accommodate conditions that limit mobility in the fingers, hands, or arms.